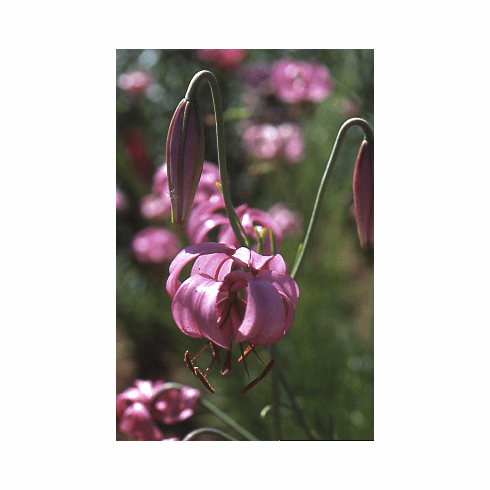 Requiring well drained, sandy soils, flowering Lilium cernuum from seed is a rewarding challenge even though this tends to be a short lived lily in the garden. Bulbs must be kept dry during the winter months or they will rot. Seed germination is immediate epigeal. Though highly prone to basil rot and virus infection, this beautiful species from Northeast China and Korea certainly has a home in the well prepared rock garden. With rather small, lilac-pink, Turk's Cap flowers, Lilium cernuum usually reaches a height of about 24 inches. We have always found it to be a lovely addition to the garden, but never sow all your seed in any given season, always leave enough in the freezer for those inevitable years of crop failure giving yourself the option to start over. Photo inset bed of L. cernuum in cool greenhouse.